Online rumour and speculation surrounding Nintendo's future plans for its immensely popular DS handheld is on the increase, as the games industry looks towards two of its biggest trade events in the coming months – the Games Developers Conference in San Francisco in March and E3 in Los Angeles in June. The latest speculation focuses on the news that Nintendo has filed a patent in January 2010 for a force feedback system, that would deliver a vibration to the users hand via the DS's pen-style stylus. Broke My Controller unearthed the latest patent – which you can see in full here – which would require the user to push the stylus into the screen to execute an attack or some other move, with the user feeling the vibration back through their hand via the stylus to confirm the move. "A game apparatus includes an LCD, and a touch panel is placed on a top surface of the LCD. A player instructs an enemy character displayed on the LCD by use of a stick to attack the enemy character. For example, in a case that the enemy character exists at a depth of a game screen, little damage is applied to the enemy character, and a weak vibration is applied to the game apparatus. 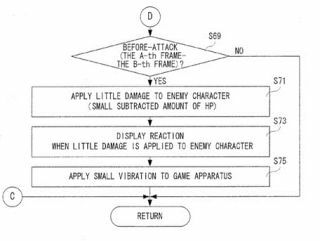 "Conversely, in a case that the enemy character exists at a front of the game screen, much damage is applied to the character, and a strong vibration is applied to the game apparatus. In either case, the vibrations are transmitted to the fingers or hands of the payer via the stick." Nintendo's new DSi XL finally arrives in the UK early next month. On 5th March, to be exact.